These gluten-free pancakes packed with hearty oatmeal and pecans. Every bite is infused with the flavors of vanilla and cinnamon. A warm mixed-berry compote is the final flourish just before serving. This recipe is great when you want to enjoy a casual yet elegant Sunday brunch with friends. Serve with your favorite brunch sides like bacon, sausage or hash browns. To really get the party started, pop open a bottle of bubbly and make mimosas or bellini for the crowd! 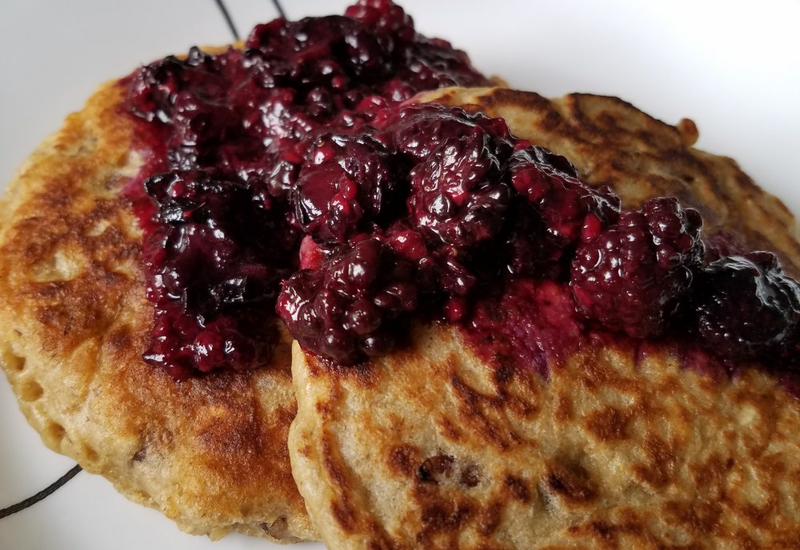 Make this dish vegan by replacing the eggs with 2 tablespoons flaxseed meal blended with 6 tablespoons water, and using water in place of the butter in the berry compote. Store leftover compote in an airtight container in fridge up to 5 days. Per Serving: 778 calories; 34g fat; 109.1g carbohydrates; 13g protein; 108mg cholesterol; 744mg sodium. These pecan pancakes are on regular rotation at our house. I've made this recipe with and without the berry compote. They're both fantastic. A couple of things to love about this recipe: the fact that it's gluten free, made with pecans, and served with warm compote. This is probably one of my favorite breakfast pancake dishes to date. Sweet, fluffy and great flavor.